Veteran of the Day graphic created by Reynaldo Leal for the U.S. Department of Veterans Affairs. Today’s #VeteranOfTheDay is Marine Corps Veteran Brad Pesek. Brad served for 20 years and made multiple deployments during Operation Iraqi Freedom. Born in Saint Louis, Missouri, Brad enlisted with the United States Marine Corps in June 1998. He attended boot camp at the Marine Corps Recruit Depot in San Diego, California and infantry training at Camp Pendleton, California. After completing his training, Brad was assigned to Bravo Company, 1st Battalion, 3rd Marines stationed at Marine Corps Base Hawaii. There, Brad was deployed twice to Okinawa, Japan as part of the Unit Deployment Program. Following his time at Marine Corps Base Hawaii, Brad was assigned to the School of Infantry at Camp Pendleton, California. There, he served as a Marine combat instructor and reached the rank of sergeant. After his time serving as an instructor at Camp Pendleton, Brad was assigned to 3rd Battalion, 5th Marines, where he served as a squad leader, machine gun section leader, mortar section leader, and platoon sergeant. During his time with 3/5, Brad was deployed twice to Iraq in support of Operation Iraqi Freedom, once in January 2006 and once in September 2007. Following his time with 3/5, Brad returned to the School of Infantry at Camp Pendleton for a second tour as a Marine Combat Instructor. There, Brad was assigned to the Infantry Squad Leader Course, where he served as a squad instructor, assistant chief instructor, and later chief instructor. By December 2010, Brad had earned the rank of gunnery sergeant. Upon completing his tour as a Marine combat instructor, Brad was assigned to 2nd Battalion, 3rd Marines stationed at Marine Corps Base Hawaii. There, he served as a weapons platoon sergeant and company gunnery sergeant. During this time, Brad deployed twice in support of the Unit Deployment Program, serving in Darwin, Australia in 2012 for the first Marine Rotational Force-Darwin and in Okinawa, Japan in 2013. Following his time with 2/3, Brad began working as the assistant training chief for the 1st Marines, G-3 Training Section at Camp Pendleton, California. In January 2015, Brad was promoted to first sergeant and assigned as company first sergeant of the 1st Marine Raider Support Battalion. Brad retired from the Marine Corps in February 2019 after 20 years of service. Throughout his long service, Brad earned the Navy and Marine Corps Commendation Medal, the Navy and Marine Corps Achievement Medal with Combat Distinguishing Device, the Combat Action Ribbon, and the Meritorious Service Medal. Thank you for your service, Brad! 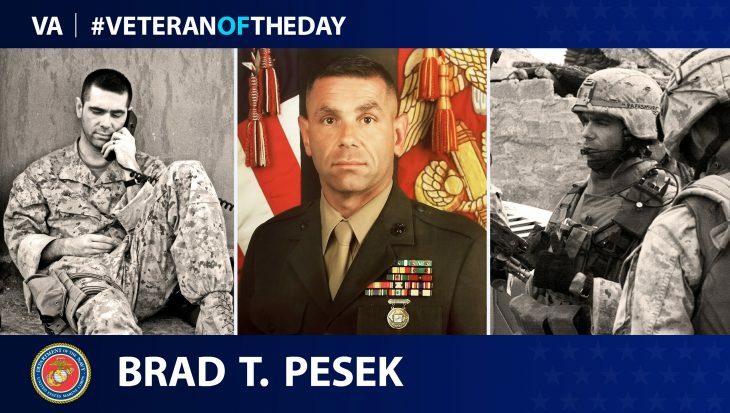 Thank you for your service – Marine Corps Veteran Brad Pesek!